I’ve always liked the idea of traveling indefinitely with only a backpack, so in 2016 I decided to try it. I got rid of everything I owned that didn’t fit in an 18L laptop backpack and replaced everything else with the best version of it I could find. I’ve been living out of my backpack ever since. 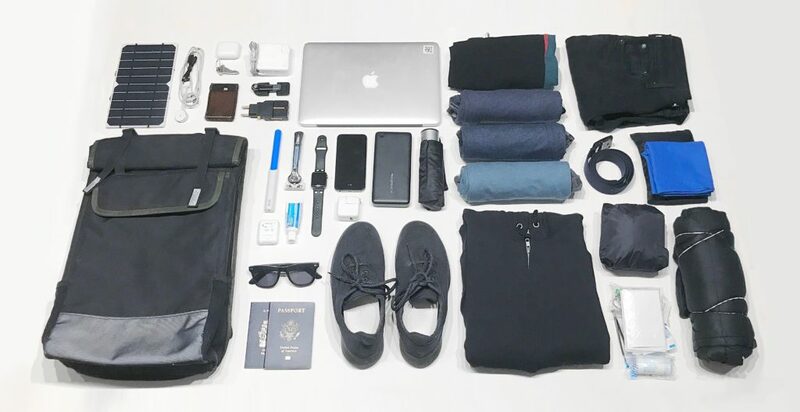 My pack contains everything I need for traveling to virtually every country on earth. It works for all weather, and I’ve tested it in subzero snowstorms and on hiking trips in the Sahara and Mojave deserts. The core idea is to keep the number of things I own to a minimum but to never not have something that I need. My bag currently weighs 13.67lbs/6.2kg and I own ~fifty things. My goal is to drop the weight to 11lbs/5kg, a carryon limit a few airlines are implementing. Detailed weights on my Lighterpack. Anyways, here’s my list. I included some affiliate links, so if you buy something from this list, thanks! Backpack. Lately I’ve been switching between the Timbuk2 Prospect, Division, and Rogue. I haven’t yet found the perfect bag. Travel pouch. Custom travel folio. 13″ 2014 Macbook Pro. Love how durable the older Macbooks are, but it’s 1/4th the weight of my bag so I’m thinking about replacing it with a lighter model soon. iPhone 7. Two, one as a backup in case I lose my main phone or to switch SIMs. Apple Watch. For health tracking and ‘Hey Siri, remind me’. Airpods. Easily the best tech purchase I’ve made. Airpods are literally magic for travelers. RAVPower 26,800mAh battery. Holds about a dozen phone charges and is the largest powerbank airlines allow on board. Three ports means I can utilize all my cables and charge most of my tech at the same time – iPhone/Airpods, Apple Watch, Spectacles. I’ll eventually replace it with the 30W version, which could charge laptops and drones, or this Kickstarter one if it lives up to the hype. Solar Cells. Two 5.5W solar cells. Can charge my phone almost as fast as a wall outlet in ideal conditions. Great for outdoorsy trips longer than a few days. Joby Griptight One tripod. I replaced my larger tripod for one I could keep in my pocket. This tripod is so small it can actually fit inside that tiny watch pocket all Levi’s jeans have. Universal travel adapter. Compact outlet adapter that works in most countries. Macbook wall adapter. This thing is massive, really need to upgrade my laptop. 29W Apple wall adapter. One is enough since I also charge stuff off my powerbank. Lightning cable. Two, in case I break one. Micro USB cable. For the powerbank. Two, in case I break one. Apple Watch charger. 0.3m version. Outdoor Research Transcendent down jacket. Compressible enough to fold into its pocket and disappear in the bottom of my bag, while also warm enough to go anywhere. Eventually will replace with the lighter Montbell Plasma 1000 or MH Ghost Whisperer. Outdoor Research Helium II rain jacket. Compacts to the size of a fist and is more waterproof than jackets that weigh 10x more. Undisputedly the best rain jacket ever made. Hanes hoodie. I exclusively wore startup swag hoodies before I decided to drop branding from my clothing. I liked how durable my swag hoodie was though, so I looked it up and got the same one off Amazon. No idea how they make hoodies this good for $11. Buff. Multi-purpose headgear. Useful as a face mask in cold weather. Nike Flex Experience Run 7. Compact, cheap, and durable. Next Level t-shirts. 4 shirts, all in one color, no branding. Not quite as good as Outlier’s shirts, but if I break one I can replace it for less than a cup of coffee. Uniqlo Airism boxer briefs. 4 pairs. Rated as one of the best travel boxers for good reason. They’re also the only clothing product I’ve purchased in a physical retail store in a few years. Darn Tough socks. 4 pairs. Darn Tough socks are so indestructible that if they rip the manufacturer will ship you a brand new pair. They’re made out of merino wool, which means they work for any activity in both warm and cold weather. I’ve traveled over 1,000 miles with each pair I own and they still look brand new. Levi’s 511 Slim Fit jeans. I like Levi’s jeans because they’re durable and can last weeks between washes. There are other dedicated travel pants that I’ve considered switching too but I always come back to these pants. Couldn’t imagine any way to improve them. Worn with a canvas belt. Swimsuit. A cheap pair of board shorts off Amazon. Sweatpants. A cheap pair of sweatpants off Amazon. Wallet. A minimalist leather wallet I made myself. It contains my debit/credit cards, ID, NYC/LA/SF subway cards, and Cash Card). Passports and personal documents. Stored in a plastic envelope to stay waterproof. Snapchat Spectacles (Nico). Sunglasses that look ~similar to normal wayfarers that can record short videos when I tap a button on the frame. Makes it a lot easier to document an adventure than taking out my phone and opening the camera app. I can also scroll through my last two years of ‘memories’ recorded from my POV just like in that Black Mirror episode and relive experiences or show them to a friend. I used to have a custom pair of Spectacles but I accidentally broke them on a hiking trip so now I’m back to a new stock pair. Umbrella. I compared dozens of expensive umbrellas only to find out that a $15 umbrella was the most compact. This one is even smaller, but I can’t find a place to buy it in the US. Packtowl. These things are amazing since they dry fast and stay clean. The version I use is 3oz heavier than their ‘ultralight’ style, but also more durable and comfortable. Screwdriver set. In case I need to replace my iPhone screen or something. True Utility Keytool. Probably the world’s most compact bottle opener multitool. Toiletry kit. Contains a Quip electric toothbrush, toothpaste, floss, a razor, and deodorant. Medkit. Contains Advil, bandaids, gauze bandages, medical tape, antiseptic wipes, alcohol swabs, and tweezers. Also a sewing kit, fishing kit, water purification tablets, and duct tape. The stuff I toss in my backpack for lengthy outdoor trips. Used this gear when hiking 400 miles of the PCT from Mexico to LA in June 2018. Ideally this would be part of my everyday carry, but fuel and knives make it impossible to fly so I opted to keep everything in storage instead. With all outdoor gear added, my onebag weighs 18.98lbs/8.61kg. My goal is to bring the weight to under 15lbs/6.8kg to make it more comfortable. Lighterpack. 3F UL Gear tent. The best affordable UL tent, literally 1/10 the price of the next-best tent. Sleeping bag. Unknown brand. Technically a liner but it works well enough for me. Outdoorsman sleeping pad. Planning to replace this with the lighter NeoAir Xlite small. Petzl headlamp. For hiking at night. Sawyer Mini water filter. Probably the most important thing on this list. Gerber Paraframe Pocketknife. Wish it could be part of my everyday carry, but TSA. Toaks 450mL pot/mug. Smallest possible size capable of cooking a packet of ramen. BRS-3000T stove. Stored inside the pot when not in use. 4oz fuel canister. For the stove. Titanium spork. Collapsible, stored inside the pot. Bic lighter. For the stove. Stored inside the pot. Smartwater 1L bottle. With a sports cap to backflush the water filter. Other travelers’ onebag lists that have inspired me over the years: Tynan, James Clear, Matt Mullenweg, Vicky Lai, and James Blackshine.